So how could we resist giving her her very own cooking show?! Delta: G'day everyone! 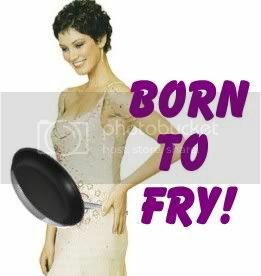 Welcome to Born To Fry! The show where...love is on the menu! That's right, because today I have my boyfriend Brian McFadden in, to whip up some romance! Hi Brian! Brian: Hey Delta! So, what can I do to help out in the kitchen? Delta: First of all, I'd like you to peel these apples for me...is that alright? Brian: Sure! After all, that's what's "Peel To Me!" Delta: Great! And after that, I need to you prepare some pears for me, if you can. Network Executive: THIS IS AXED.